Researchers of MEPhI (Russia), the University of Rostock (Germany) and the University of Pisa (Italy) suggest a new method for generating extremely strong magnetic fields of several giga-Gauss in the lab. Currently available techniques produce fields of one order of magnitude less than the new method. In nature, such superstrong fields exist only in the space. Therefore, generation of such fields in laboratory conditions provides new opportunities for the modeling of astrophysical processes. 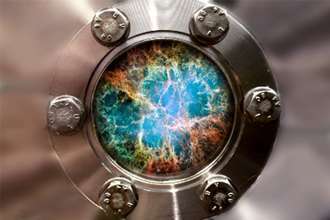 The results will contribute to the new research field of laboratory astrophysics. The Faraday effect has been known for a long time. It refers to the polarization plane of an electromagnetic wave propagating through a non-magnetic medium, which is rotating in the presence of a constant magnetic field. There is also an inverse process of the generation of a magnetic field during the propagation of a circularly polarized wave through a crystal or plasma. It was considered theoretically in the 1960s by Soviet theorist Lew Pitaevsky, a famous representative of Landau's school. The stronger the wave, the higher the magnetic field it can generate when propagating through a medium. However, a peculiarity of the effect is that it requires absorption for its very existence—it does not occur in entirely transparent media. In highly intense electromagnetic fields, electrons become ultrarelativistic, which considerably reduces their collisions, suppressing conventional absorption. The researchers demonstrate that at very high laser wave intensities, the absorption can be effectively provided by radiation friction instead of binary collisions. This specific friction leads to the generation of a superstrong magnetic field. According to physicist Sergey Popruzhenko, it will be possible to check the calculations in the near future. Several new laser facilities of record power will be completed in the next several years. Three such lasers are now under construction within the European project Extreme Light Infrastructure (ELI) in the Czech Republic, Romania and Hungary. The Exawatt Center for Extreme Light Studies – XCELS is under the development at the Applied Physics Institute RAS at Nizhny Novgorod. These laser facilities will be capable of the intensities required for the generation of superstrong magnetic fields due to radiation friction and also for the observation of many other fundamental strong-field effects. Only if superconducting magnets are less energy efficient, which i doubt, The goal is to generate energy, not consume it.